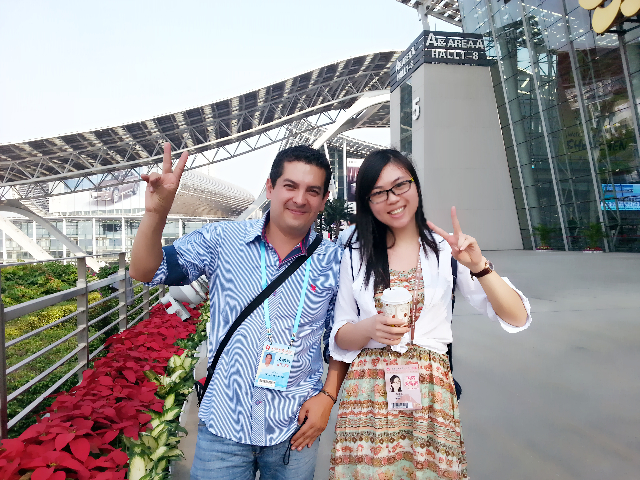 It was a sunny day that I first time went to the Pazhou, which is the right palce for the 114th Canton fair. As we can imagine, many businessman in appropiated suitcases walking around. A whole new has begun. I was an translator for an Limited company which produce the iPhone 5 or 5s cases recently. Before i was there, I did a large range of reseach and training by meself. Honestly, though we are learning English all the time, but we are still suffering from having no real environment to practise. To recover it, I talk with my foreign friends online every night to keep the fresh of English. So I'm not surprised when they compliment my fluent English and standard pronounciation. During the process, I was always patient with every customers who is interested in our products. Since I have one year promotion exerience, I could easily drove their attention to the merts of our products, and some refinements and improvements. Luckily, I wasn't a freshman in this trade Fair. I did a lots of this kinds of communications with foreign friends in the past, which guaranteed my 100% confidence. Besides, My boss is really considerate, coffee and cakes are my rewards from geting orders. Insporing, was't it? Speaking of some emergencies or accidents I met, I would like to give one example, the modles of the cases were distributed freely to the customers. What's more, I need to make all our clients get to know how it works. Once there was a time that one of the cases has a little defect on it, my client started to "roll their eyes", Oh-noo. But finally, I lead them to my booth to explaint why that could happen, and some easy tips to get it over with it. Whew...Finally, I got over it. Canton Fair is a very cherish experience for me, I got many business cards, and make good contact with them. But the most important point is, I got more informations about this world-trade fairs. And more capable skills of dealing with people in Business life.